OL30 Yorkshire Dales – Northern and Central Areas. 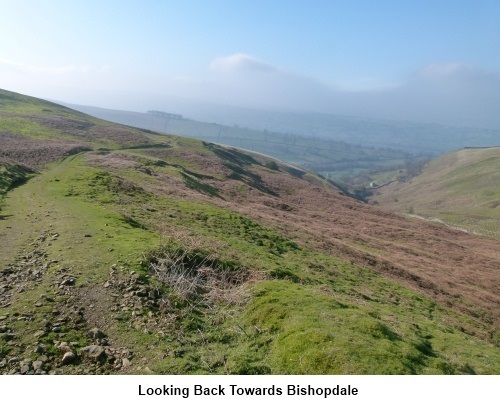 Introduction: Pen Hill is a distinctively shaped hill which overlooks Wensleydale to its north and the lesser known Bishopdale to its west and Coverdale to the south-east. 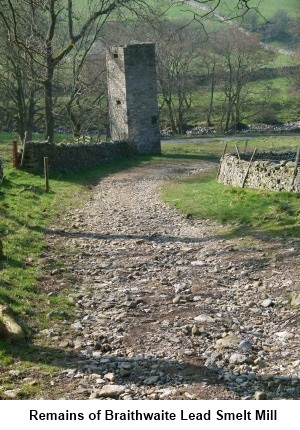 This walk is intended as a circuit around Pen Hill but there are the options of diversions to the summit (adding 1 mile each way) and to the villages of West Witton (adding ¾ mile each way) and West Burton with its impressive village green and waterfall (adding less than ¼ mile each way and well worth the visit). 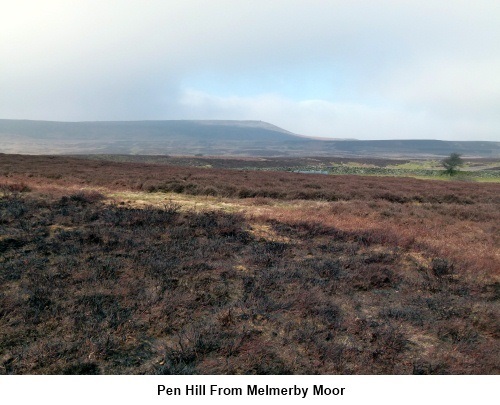 The walk provides lovely views of all the dales walked and crosses the bleak Melmerby Moor. There are the remains of a beacon on top of Pen Hill, part of the national network built to warn of a Spanish invasion. 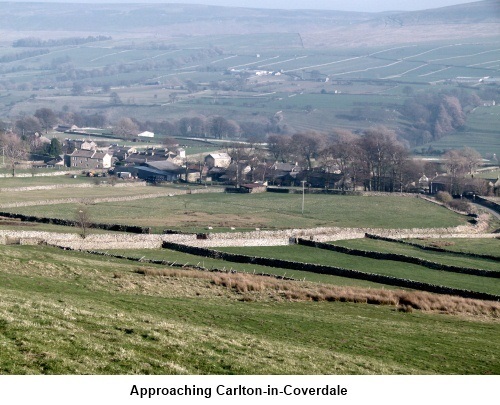 This village starts in the village of Carlton-in-Coverdale. There are many places in Yorkshire with the name Carlton and this village is often referred to as Carlton-in-Coverdale to distinguish it, although it is only shown as Carlton on the map. 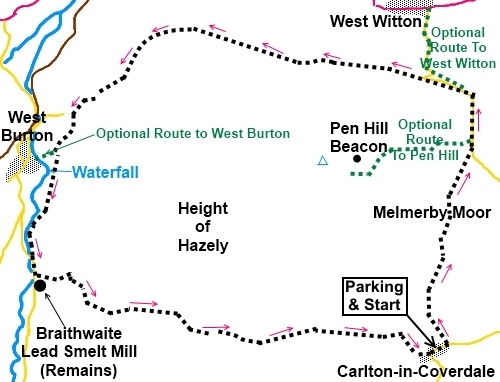 You can get there via the exciting road over Park Rash from Kettlewell or by turning south off the A684 at West Witton, via Melmerby. There is a little road walking but the lanes are quiet. Parking is on the main street at Carlton-in-Coverdale, as close as you can sensibly get to the Wesleyan chapel by the phone box which is where the walk begins. 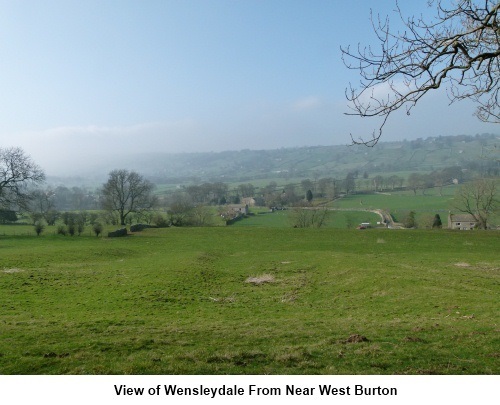 There are refreshment opportunities at various pubs in West Witton, West Burton and Carlton-in-Coverdale. Start: Walk alongside the chapel (SE 065847) following the fingerpost for Melmerby Moor 1½ miles, along a broad track. Pass a small attractive waterfall on the left and just after this go right through a gateway continuing to follow the broad track. After passing a ruined cottage, turn right. The path becomes a little indistinct but follow the wall down to Micklethwaite Gill (SE 063854) where it becomes clearer. Climb the short stony track over the stream and after going through a gateway, branch off left. Do not follow the more imposing track straight on. Through the next gate, keep straight ahead. 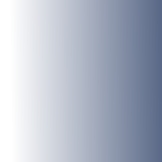 As you approach a wall, turn left on to a more prominent track (SE 064856). Go through another gate and straight ahead across a broad track – do not be seduced by the white posts indicating another track to the left. Cross another broad track keeping straight ahead by which time you should be in sight of the road. Turn left and walk along the road. Superb view of Wensleydale now come into view. Cross a cattle grid and if you are intending to visit the summit of Pen Hill, look out for a finger post SE 067869) on the left immediately after it. The path to the summit is clear, passing to the right of a small pond. Return to the road the same way. Walk along the road and at the junction by Pen Hill Farm (SE 068875), turn left signposted West Witton. If you are intending to visit West Witton, look out for a fingerpost on the right which takes you down Witton Steeps to rejoin the road down to the village. Return the same way as far as the bottom end of this footpath but continue up the road, turning right along the walled lane on the second hairpin bend as in the next paragraph. If you have not diverted to West Witton, continue along the road from Pen Hill Farm and as the road bends sharp right (SE 062876), keep straight ahead on the walled track signposted West Burton 3 miles. The track offers some lovely views of Wesnleydale and you stay on it for about that distance ignoring any turns off, including the one at a fork signposted West Burton via Hudson Quarry Lane. Keep right here. As the main track descends through some trees, look out for a fingerpost hidden amongst the bushes on the left (SE 023872), “West Burton via Barrack Wood”. Take this path through the trees and as the wood bends to the left, go through a walkers gate fingerposted for West Burton and follow the grassy path. After 100 yards or so, look out for a fingerpost for Rookwith Bridge and Cote Bridge (SE 021868). 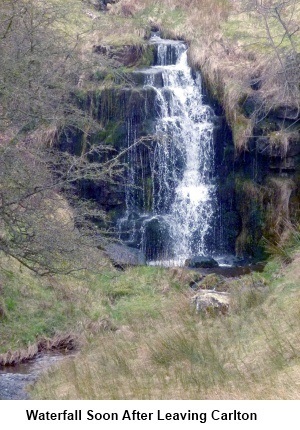 Turn left here, unless you want to visit West Burton and its waterfall, in which case carry straight ahead and return to this spot afterwards to continue the walk. Look out for a gateway on the right marked with a yellow blob (before you get to a barn) and go through this down towards the beck (Walden Beck). Follow the beck, passing (but not crossing) a footbridge and follow the sign for Cote Bridge. At the caravan site, the path gets close to the waters edge to the right of the field boundary wall. At the road, turn left (SE 019856). Pass the entrance to Cote Farm then turn left following the fingerpost for “Public Bridleway Carlton 3 miles”. 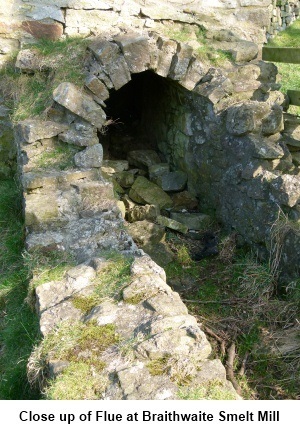 Pass the remains of Braithwaite Lead Smelt Mill with its chimney and short length of flue, last used in the 1870s. The stony walled track rises quite steeply. Go through a gateway (SE 024853). Here the footpath as shown on the map and the reality differ slightly. Turn right and follow the broad main track as it curves left, following the wall. At the wall corner, turn sharp left to follow the obvious track. A few yards further on, you are back on the “official” bridleway. As the track reaches the highest point, it splits. Take the right hand fork. Go through the next gate and turn right. At Howden Lodge, in a copse of trees, turn left to join the farm track which takes you back to Carlton. Ignore a left hand fork towards Pen Hill.